August marks 10 years since OnTrac first opened its doors and began supporting the UK rail industry, as it moved towards digitising its existing paper-based processes and began its journey towards the Digital Railway. To celebrate this remarkable milestone – and as part of OnTrac’s ongoing 10th anniversary celebrations – PR & Communications Manager, Vicki, will be sitting down and chatting to a selection of OnTrac team members chat about their role at the company, and why OnTrac is such a wonderful place to work. 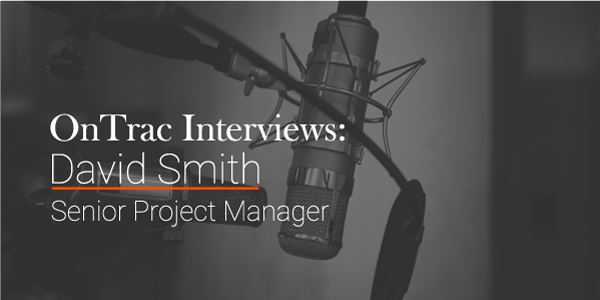 Kindly offering his services as the inaugural OnTrac interviewee, is the lovely David Smith. David is our fearless Senior Project Manager and one of the most hard working and dedicated members of the OnTrac team. He is incredibly supportive of everyone he works with, and the wider business, playing a crucial role in every department in the company; from keeping our software development team from running riot (they are the Lost Boys of the OnTrac team, clearly! “Does this make you Peter Pan or Wendy, David?” asks Vicki. ), to managing the company’s project delivery team, David’s expertise, deep knowledge and understanding of the product suite and genuine willingness to support his team members, makes him an incredible employee, co-worker and friend to so many of us throughout the OnTrac team. David’s role has also seen him expanding the OnTrac team, by conducting interviews and integrating new staff across almost all departments. His recent acquisitions include adding another body to our ever-expanding apprenticeship team – the most recent of which, Reece Wakefield, has given up his summer to come and work with us – and our software development team, recently hiring Jack Johnson and our new DevOps Manager, and Filip Kulig, a backend software developer, who joined the gang on Wednesday. With a suite of award-winning software products, OnTrac have enabled positive digital change across the rail industry for 10 years. Copyright © 2018 OnTrac Ltd. All Rights Reserved.